Aerial view of Shinagawa Station and nearby hotels, c. 1980. 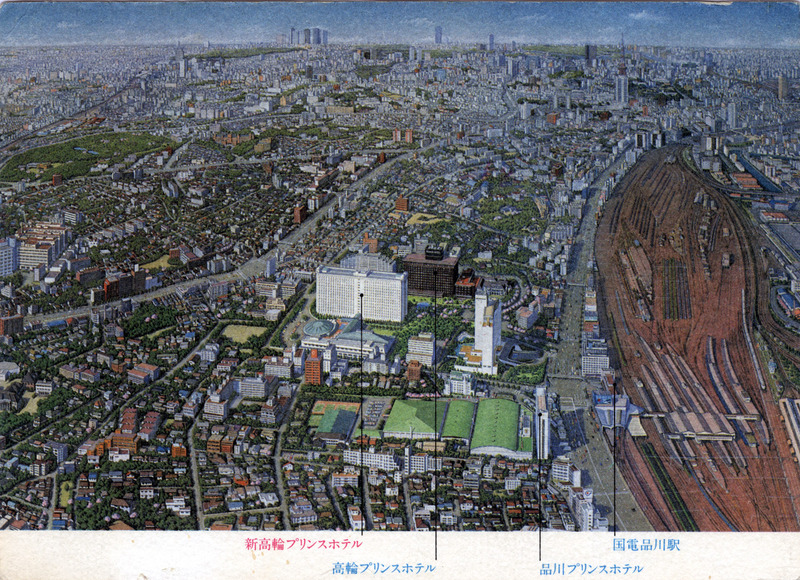 Aerial view of Shinagawa Station (right) and environs, c. 1980. The three highlighted building are (left to right): New Takanawa Prince Hotel, Takanawa Grand Prince Hotel, and Shinagawa Prince Hotel. Two of the three hotels are effectively managed as one, and are situated in a 10-acre garden which formerly belonged to Takeda Palace of Prince Tsuneyoshi Takeda, a member of the Japanese Imperial Family. Note the large rail yard at right. Shinagawa grew rapidly from a feudal post station to a modern industrial city with the development of rail transport during the Meiji and Taisho periods. Much of Shinagawa was destroyed by firebombings during the Pacific War, but the district was quick to achieve postwar recovery. SONY established its corporate headquarters in Shinagawa after its founding in the 1950s (before moving to nearby Minato-ku in 2006); Japan Air Lines (JAL) is headquartered in Shinagawa, as is Bandai Games, Fuji Electric, Seimens Japan, and MOS Burgers. From the wiki: “Shinagawa is one of Japan’s oldest stations and was opened on June 12, 1872, when the service between Shinagawa and Yokohama was provisionally started (four months before the inauguration of ‘Japan’s first railway’ between Shimbashi and Yokohama through Shinagawa on October 14, 1872). This line is a part of the Tōkaidō Main Line. Sadly, nothing remains of the original late 19th-century structure. “Later on March 1, 1885, Nippon Railway constructed and opened the first line from Shinagawa to Akabane linking those two then-suburban towns with steam locomotive freight and passenger service. By December 1909, electric trains were running from Karasumori (now Shimbashi) to Ueno in a circular route via Shinagawa, Shinjuku and Ikebukuro. Takanawa station of the Keikyu Line (then Keihin Railway Line) opened on March 11, 1924 across the street from Shinagawa station. It would become incorporated into Shinagawa station in 1933.